Welcome to Silver Dollar Finder! This website focuses on collecting Morgan and Peace series silver dollars and gold and silver bullion. At the request of visitors, information on modern dollar coins has been added. This website gives general background information on each coin series for those new to numismatics. It also serves as a quick reference and bidding tool for buying online using the table to the right. The links to common auction searches will save time by avoiding the need to manually retype searches. This site gives links to two respected price guides, each providing fair market values for all standard coin grades. Morgans were minted from 1878 to 1904 and again in 1921. Despite their age, most dates of Morgan and Peace dollars can be acquired in excellent condition for reasonable prices, making it possible to build an extensive collection. The Morgan design was used from 1878 to 1921, followed by the Peace design from 1921 to 1935. Silver dollars were minted in large quantities during this era largely to satisfy silver mining interests. Then as now, dollar coins were not popular with the public. As a result, most of the dollars sat in government vaults, used to back circulating silver certificates. Yet most of these coins no longer exist - millions were melted during both World Wars in response to a silver shortage and in the 1960's due to rising silver prices. As a result, the total surviving population of many dates and mint marks is much lower than the original mintage figures. Many coins that did survive, however, remain in the uncirculated range and therefore make nice collections. The 1921 Morgan dollar had the highest mintage, and as a result, is an excellent opportunity to acquire an uncirculated Morgan dollar at a reasonable price. Many coins are also authenticated and graded by one of the major third-party coin grading services, making them easier to purchase online. The American Eagle series, started in 1986, are a popular way to hold gold and silver. Gold, silver, and other precious metals are commonly held through coins. Unlike numismatic coins which are valued based on the rarity of the coin and its condition, bullion coins derive their value chiefly from their precious metal content. There are two main types of bullion coins: 1) Coins minted as circulating coinage many years ago, such as pre-1965 silver dimes, quarters, and half-dollars, and 2) Modern coins minted for sale to investors, like American Eagles or South African Krugerrands. This website provides a Bullion Information page describing the most common gold and silver bullion types. Next is a page on Buying Gold and Silver Bullion, which contains a reference chart, current spot prices, calculators for finding precious metals content, and links to online auctions. 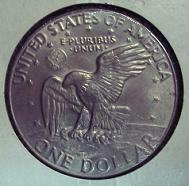 The Eisenhower dollar reverse honored the lunar landing.. While the United States no longer makes circulating "silver" dollars, it has produced four dollar coin types since silver was removed from circulating coins. From 1971 to 1978 Eisenhower dollars were minted, honoring the late president and the lunar landing. These large coins were the same diameter and thickness as earlier silver dollars. They did not see significant use by the public but remain popular with collectors. Susan B. Anthony dollars were made from 1979 to 1981, and again in 1999. These smaller coins were easily confused with quarters and unpopular partly for this reason. Gold-colored Sacagawea dollars were minted from 2000 to 2007. The United States is currently producing gold-colored "Presidential" dollars, honoring former US presidents in the order they served. This website provides brief information on each modern dollar series, as well as a reference page with links to online auctions. Buying coins online presents both new opportunities and risks. The sheer number of coins available through online auctions far exceeds even the best coin shows and is extremely convenient. However, coins cannot be personally inspected before purchase. Many buyers are also concerned about the occasional dishonest seller. Fortunately, these concerns can be mitigated. A collector or investor may stick to independently certified and graded coins to avoid grading uncertainties. Fraud can be prevented by using an intermediate payment service, like PayPal, so that the seller is never given credit card numbers or other sensitive financial information. A buyer may also look to a seller's feedback rating for his previous coin sales. For more information, see the Online Coin Buying Guide. A certified coin encapsulated, or "slabbed" in a hard plastic holder. This 1922 Peace Dollar was graded MS-65 by PCGS. Major coin grading service will authenticate and grade valuable coins to prevent counterfeiting and ensure consistent, impartial grading. These certification services seal the graded coins in hard-plastic holders to preserve the coin and prevent tampering. Initially, only coins costing at least several hundred dollars were certified due to the cost of certification. However, nowadays it is common even to see $30 coins certified, especially in popular series like Morgan and Peace dollars. Certified coins are easier to buy and sell through online auctions or by mail-order or any other venue where the buyer cannot personally inspect them. They typically sell for a premium over other coins in the same condition. Grading services use the standard 70-point grading system, where grades of 60 to 70 are for uncirculated coins. For information on coin grading in general see the Coin Grading System. What to Look For: The best known coin grading services are American Numismatics Association Certification Service (ANACS), Professional Coin Grading Service (PCGS), and Numismatic Guarantee Corporation (NGC). These grading services have established a long track record of consistent grading. The services are typically referred to by their abbreviations. What to Be Wary of: There are many new grading services which have not yet established a track record for accurate and consistent grading. Some services simply need more time and may join the list of established services. Others seem to give most coins extremely high grades or are inconsistent. When encountering coins graded by unknown services, it is beneficial to pay special attention to the coin itself or do research on the reputation of the unknown grading service. Indian Head Cents - These coins were minted from 1859 until 1909. They were widely popular among the public, tired for the large cents they replaced. Yet despite their wide circulation, certain common dates are still available at affordable prices in uncirculated condition. Coins minted from 1859 to 1864 are made of copper-nickel alloy and are sometimes called "white" cents. Those made from 1864 to 1909 use the familiar bronze alloy of 95% copper, and 5% tin and zinc. Indian Head cents are often described as "red" or "brown" depending on the degree of toning. This website provides a page with more information on Indian Head cents, followed by information on Lincoln Wheat Cents. Lincoln "Wheat" Cents - These coins were minted from 1909 to 1958. Designed to commemorate the 100th anniversary of Lincoln's birthday, the portrait of Lincoln on the obverse is the same one used on modern cents. The reverse featured two wheat stalks with the words "ONE CENT" in large letters nestled in between the two stalks. These coins were made of bronze (95% copper, 5% tin and zinc), except for 1943 cents, which were minted from steel coated with zinc and have a chrome-like appearance. Uncirculated coins are often available for many dates/mint marks. This website provides a page with more information on Lincoln Wheat cents, following the information on Indian Head Cents. Indian Head "Buffalo" Nickels - Minted from 1913 to 1938, Buffalo nickels were popular among the public. The detailed, high-relief design is aesthetically-pleasing, but wore terribly. As a result, while Buffalo nickels were widely collected, relatively few exist in uncirculated condition for such a recent coin. Jefferson Silver "War" Nickels - These nickels were minted from 1942 to 1945 during World War II in order to conserve nickel and copper. These coins contain an odd alloy of 35% silver, 9% manganese, and 56% copper. This alloy corroded quickly once exposed to humidity, thus coins in uncirculated or about uncirculated condition with a pleasing appearance are somewhat rare. Proof Sets - Proof coins are double-struck in order to ensure the highest quality coin finish possible. They are initially sold as part of proof sets including each regular-issue coin for that year (cent, nickel, dime, quarter, half-dollar, dollar). Special proof sets also include commemorative coins; some sets also include the dime, quarter, and half-dollar struck in 90% silver. Proof sets from before 1955 are rare and expensive; those after 1960 are relatively affordable. In all proof sets from 1964 and earlier, the dime, quarter, and half-dollar are made of 90% silver, just as business-strike coinage. No proof sets were made from 1965 to 1967 due to a coin shortage. Uncirculated Sets - These are sold by the US Mint each year; coins picked are manufactured using the same technique as regular coins for circulation, however, the ones chosen are well-struck coins and are, of course, uncirculated.